Knowing whether or not you’re a good fit for a role is one of the most challenging parts of the job hunt. Being able to understand exactly how your skills and experience match with what a potential employer is looking for can feel like solving a riddle with no clear answer. Today, we’re announcing a feature to help ease that process - How You Match. 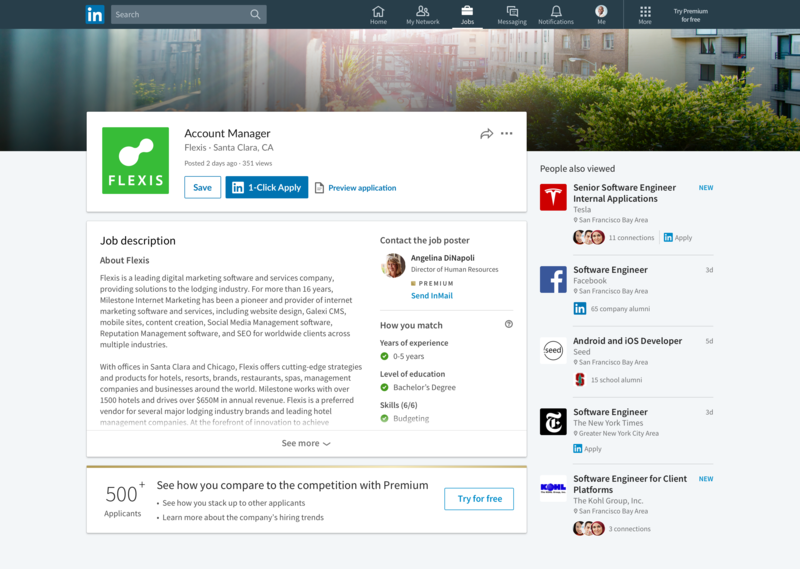 Now, when you view a job on LinkedIn, look toward the right-hand side of the page to find How You Match. You’ll find a checklist of how factors, like your education level, skills, years of experience, and current job title, match with what a company is looking for in a potential new hire based on criteria they share when posting a job on LinkedIn. Premium members will also see their applicant rank within the posting, where we’ll show you if you’re in the top percentile of applicants for the job. If you’re a match, it’s time to apply! 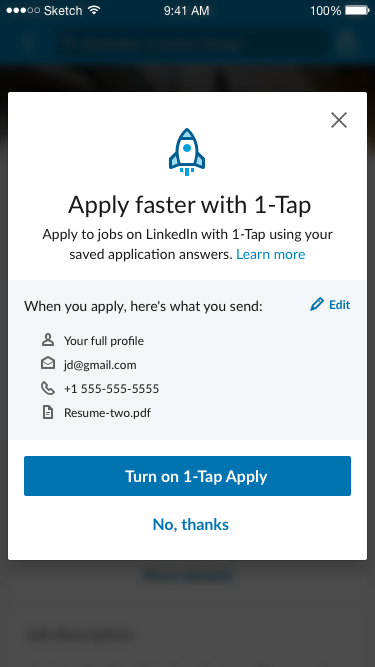 You’ll also notice that some jobs now have a 1-Click Apply button on mobile and desktop, making applying for a role on LinkedIn even faster and easier. With 1-Click Apply, you now have the option to save your basic information and resume so you can apply for a job with a single click or tap. Keep your skills fresh. In today’s quickly changing workforce, staying on top of your skills and showing what you know matters more than ever. In fact, nearly 40% of recruiters are using skills to search for talent. Some of our recent research found that soft skills like communication, and basic digital literacy skills like email and typing are in high demand from employers right now, and facing national shortages. You can now reorder and pin skills to make sure the right information is standing out. Update your location, industry and current role. These will all not only help get the most accurate results from How You Match, but will also help recruiters find you and help us recommend the right jobs for you. Having your location on your profile also makes you up to 23X more likely to be found in search results. Add your education. Your education makes it easier for your classmates and other alumni to find you on LinkedIn - and you never know what opportunity a new connection (or re-connection) might bring. Each new connection represents 400 new people you can get introduced to, 100 new companies who may be looking for talent like you, and a connection to more than 500 jobs. We’ve got millions of open roles on LinkedIn, and the right one for you is out there. 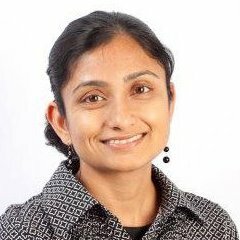 Update your profile and start exploring on LinkedIn Jobs.